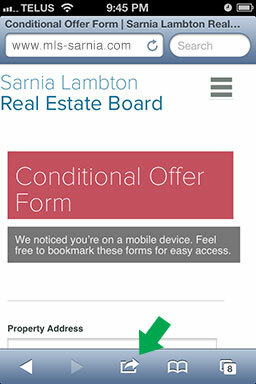 You can add direct links to the REALTOR® forms on your mobile device by following these steps. 1. On your mobile device, direct your browser to one of the forms. On that page press the action button, pictures here in the bottom left of the screen. 2. Select the “Add to Home Screen” option, pictured here in the middle of the screen. 3. Type in a name for this form and select “Add” in the upper right corner. 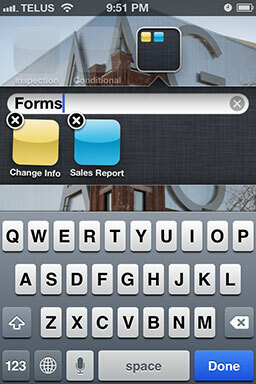 Once you have added the forms to your home screen you have the additional option of grouping them together in a folder. 1. Begin by pressing and holding one of the icons until they all begin to shake. 2. Once they are shaking simply drag one of the form icons and drop it overtop of another. 3. You can change the name of this folder by pressing the “x” in the name field and typing in a new name while the icons are shaking. 4. Drag and drop the remaining icons into the folder. 5. Press the button on your phone when you are done.